Dominion Virginia Power is offering rebates to residential customers making home improvements after participating in energy conservation programs. The new programs include a Home Energy Check-up and others offering to test and seal duct work, to tune-up heat pumps and to upgrade heat pumps to more efficient units. In the Home Energy Check-Up program, a qualifying customer will receive a report with recommendations for saving energy, as well as a rebate based on improvements involving the water heater, sinks and showerheads, lighting, air conditioning filters and other items. Dominion estimates that the average one-time incentive will be approximately $230 for customers making improvements based on check-up findings. The average incentives are $125 for the residential duct testing and sealing program and $90 per unit for a residential heat pump tune-up program. The average incentive is $200 for the heat pump upgrade program for installing a unit with an efficiency rating of 14.5 to 15.9 and $250 for a rating of 16 and higher. The City of Williamsburg has launched Williamsburg Open Forum, an online program to solicit citizen input and feedback on the City’s FY 2011 Budget. The program is accessible from the city’s website at www.williamsburgva.gov/OpenForum and allows individuals to make comments and suggestions and read what other people are saying. City officials will read the statements and incorporate them into their decision process. The Online Open Forum continues the City’s efforts to expand its online presence to provide more opportunities for citizen interaction and engagement. The program was developed by Peak Democracy, http://www.peakdemocracy.com, a non-partisan company based in California, whose mission is to broaden civic engagement and build public trust in government. Other cities using Peak Democracy include Sacramento, California; and State College, Pennsylvania. Peak Democracy provides moderation, authentication, support and privacy services. The City participated in a previous pilot project with Peak Democracy during the Biennial Goals, Initiatives & Outcomes Review in 2008. Budget will be delivered to Council March 19. Council Work Sessions are March 22 and 23, 2010, at the Municipal Building. Other opportunities for public comment include a City Council Public Hearing on April 8 and Council Work Sessions on April 12 -13. Council Work Sessions are March 22-23, 2010. A complete Budget Calendar is available on the city website. The city’s partnership with Peak Democracy is a result of its membership in the Alliance for Innovation (www.transformgov.org), an international partnership of municipalities, management associations, educators and corporations whose mission is to transform local government and advance community excellence through the discovery and application of leading ideas and practices. Representatives of Education Logistics Inc. of Missoula, MT, presented the first drafts of three redistricting possibilities at the School Board’s work session held Tuesday, Nov. 17. A series of public forums are tentatively scheduled for December and January to receive public input on the maps. Specific dates and times of these forums will be announced as soon as they are finalized. At this time the maps are a little difficult to read with the omission of street names and school locations. I am assuming that for the money that was paid to the consultant (Education Logistics ) we will have maps that are more easily deciphered ! Williamsburg/ James City County Schools will hold a public hearing on the redistricting maps Dec. 8 at James River Elementary School, 8901 Pocahontas Trail, and another on Dec. 9 at Rawls Byrd Elementary School, 112 Laurel Lane. from 6-8 p.m. The School Board will vote on the redistricting plan next spring. 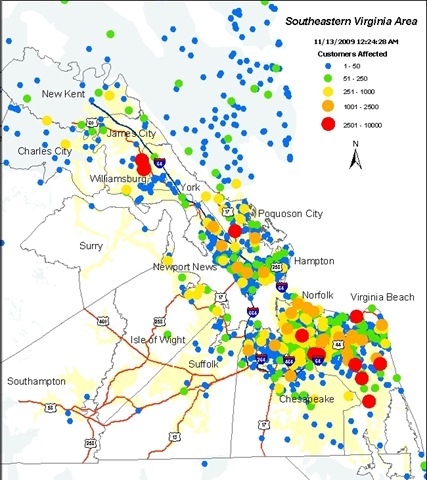 Nearly a quarter of Dominion Virginia Power customers in Hampton Roads were without power as of 12:00 am., as persistent strong winds and rising tides knocked out substations and downed lines throughout the region. These conditions, which are expected to continue through Friday, have triggered widespread outages, particularly in central and eastern areas. Service restoration efforts are underway, and restoration times will be dependent on the extent of needed repairs. The Peninsula Health District, Virginia Department of Health, has announced there will be an After School H1N1 Vaccine Clinic on Tuesday, November 10 at Stonehouse Elementary School, 3651 Rochambeau Drive. Vaccine administration will begin at 4:00 PM. The waiting line for vaccine will be closed when the clinic leader determines that no more persons can be served by 8:00 PM or that the supply of vaccine will be exhausted. Lumber Liquidators in Toano , Virginia , the largest specialty retailer of hardwood flooring in the U.S., has been recognized by Forbes Magazine as the number one best performing company in the magazine’s list of "America’s 200 Best Small Companies Of 2009." This is the first year that the Company has been included in the annual list. "We are honored to be named the #1 Best Small Company in America by the prestigious Forbes Magazine," said Jeffrey W. Griffiths, President and Chief Executive Officer. "This achievement represents the hard work and dedication of all of our employees who are the foundation of our success. We look forward to continuing to leverage the Lumber Liquidator’s value proposition to drive growth and gain market share within the hardwood flooring industry." Forbes’ list of 200 Best Small Companies in America is comprised of companies that have shown both sales and earnings growth. Candidates must have annual revenue between $5 million and $750 million, be publicly traded for at least a year, and have a stock price no lower than $5. Rankings are based on earnings growth, sales growth and return on equity in the past 12 months and over five years. Each company’s stock performance was also compared with those of its peers.